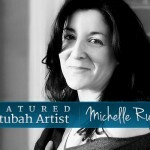 Michelle “Shell” Rummel and her work continue to grow and evolve and it is clear that there is so much more to this artist then just ketubahs. I think she may even be a writer as well. 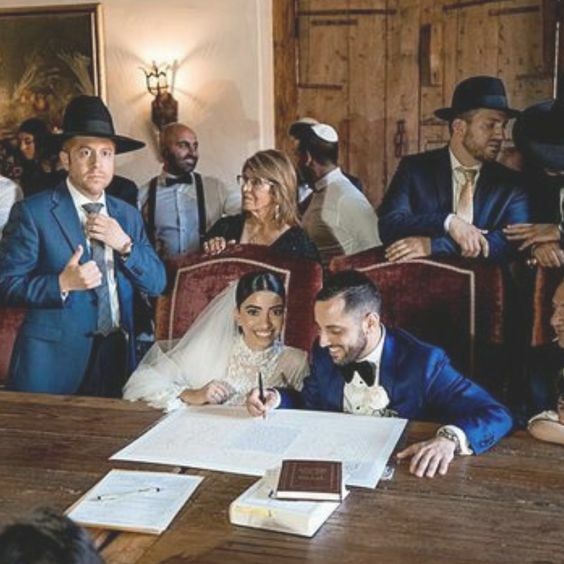 Here is an insightful glimpse behind the work of Shell Rummel Inc.
“I recognize how important the decision is for couples when choosing their Ketubah. 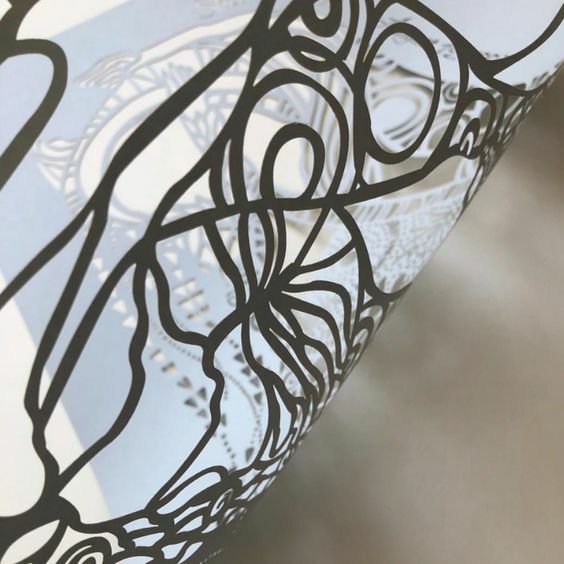 It is often challenging finding a design that resonates with both partners, and that feels just right as a visual/artistic symbol of their love and commitment to each other. When designing, I always have the client in mind well before I ever pick up my paintbrush. My creative process is thoughtful and slow. I often do extensive research when inspired by an idea and it is common for me to make many sketches prior to beginning to lay paint on paper. I liked the challenge of trying to depict traditional and timeless concepts of love such as commitment, individuality, family, and loyalty in a modern, artistic and visual way, much like creating a new language! I am a visual person, so I can visualize what I want before I paint it, but the nature of working with watercolors is often unpredictable. And so, sometimes, the paint ends up directing me and I just have to flow with it. I love when that happens! I am deeply inspired by the graceful majesty of trees, the organic repeat patterns in a Klimt painting, the mysterious colors of the ever changing sea….look closely and you’ll see these details within the brushstrokes of my distinctive style. Whether I am painting for my own pleasure or designing for my growing list of art licensing clients, my focus remains steady; to create exceptional, sophisticated artwork that is infused with beauty and grace. “What many may not know about me is that I license my artwork well beyond Judaic markets and have been steadily growing the Shell Rummel brand in the home décor retail marketplace. 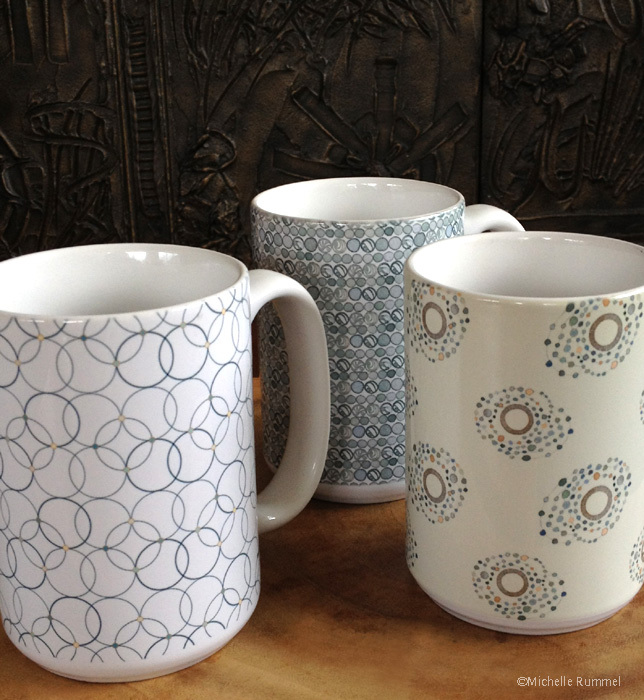 I enjoy the challenge of collaborating closely with manufacturers and retailers to design beautiful, quality products, and am proud to see my designs beginning to grace the shelves of major retailers, (like Bed Bath and Beyond!) worldwide. My current licensees include collections of fabric by the yard, Bedding and Bath Textiles and Accessories, Wall Art, Mitzvah Invitations, Stationery and Gifts. It is thrilling to be spending more and more time in New York City, visiting the showrooms that carry my collections, and attending trade shows where my art and designs are exhibited. Whether I am painting for my own pleasure or designing for my growing list of art licensing clients, my focus remains steady; to create exceptional, sophisticated artwork that is infused with beauty and grace. 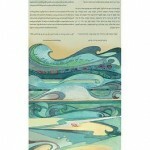 Please view my Bio page to see my entire Ketubah collection, available exclusively on Ketubah.com. “…..to create exceptional, sophisticated artwork that is infused with beauty and grace.” I think Michelle Rummel says it best about her artwork. If that is her focus, it is a good one…. and one that has paid off in ways too numerous to mention. I got married almost a decade ago, and was lucky enough to discover the artist’s work — a piece that proclaims my union with my wife and graces my home proudly. Yet, what many who work with Rummel soon discover, she isn’t simply an artist extraordinaire, but a human being extraordinaire — one who tilts the balance of societal fabric in the right direction. I wish her continued success in business and life, and am always thrilled to see her get the press she deserves. So wonderful to hear from one of her (many) fans! We hope you’ll share this post with others. A few years ago, my daughter in law called me about an idea she had for a 10th anniversary gift for her husband (my son). She is not Jewish but after 10 years with our family, has learned alot. 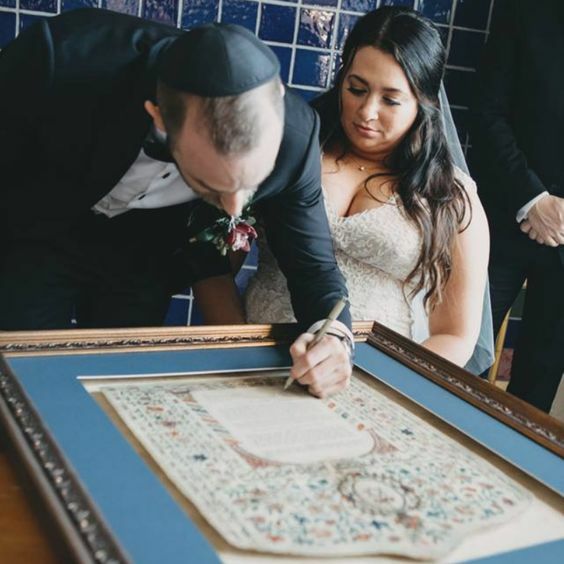 She wanted to do a ketubah for him as a gift. We researched artists and loved the beautiful trees so I made a call. Not only did Michelle personalize it with the names, dates, etc. but she had the idea to put the names of their children in the tree. 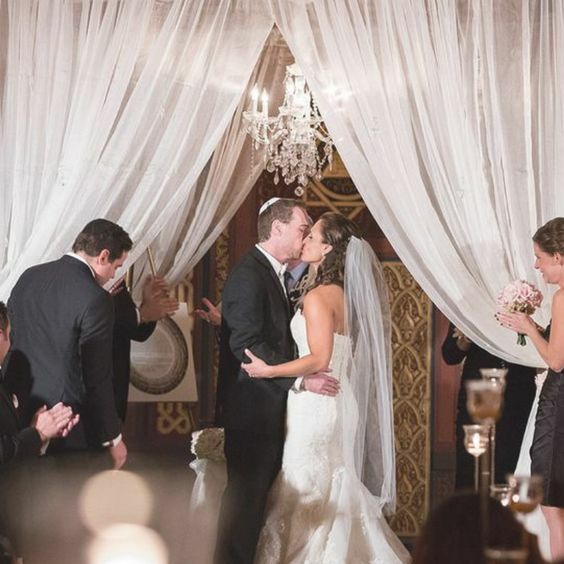 It looks beautiful in their home and was the perfect anniversary gift! I have the great fortune to know Shell personally. And before I knew of her work, I was impressed by her gentle, artistic aesthetic. When I had the opportunity to view her work, I was even more impressed at how her personality comes through in paint. I currently own more than a few of her originals, and love each one. Her work embodies all of her best qualities. I am so happy her passion and talent are becoming available to a broader community…the world is a better place with her, and her art, in it. 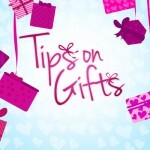 When I was looking for Ketubah’s, I was not impressed with the websites and offerings available. They all looked too cookie cutter and unoriginal for my taste. I’m not sure how I stumbled onto Michelle’s site but I’m so grateful I did. 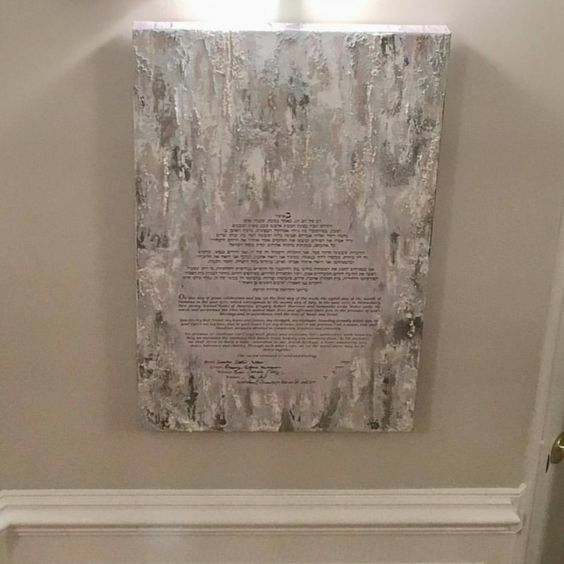 I purchased the Unfinished Symphony Ketubah four years ago and its proudly displayed in our home. I can’t tell you how many compliments we get when guests are over, and I smile all the time as I feel the tree and personalized words/phrases that I included, touch my heart and remind me what marriage is all about. I see new artwork has been added, some lovely pieces! 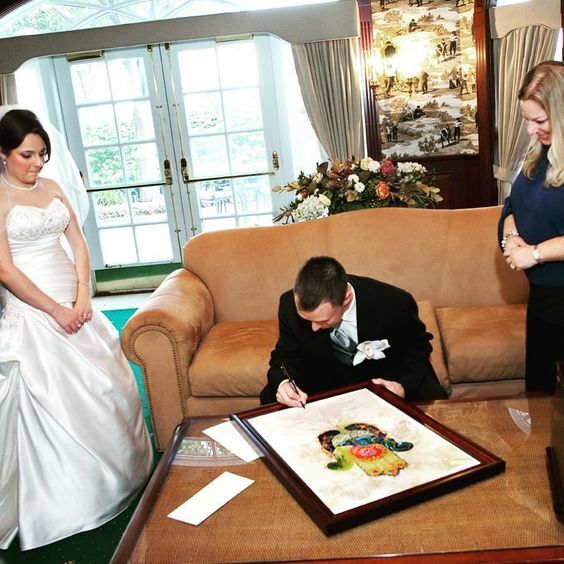 I just recommended Michelle to someone else looking as well for true Ketubah artwork. Keep up the great work! When I first stumbled across Michelle Rummel’s artwork about 10 years ago, I was struck initially by its visual beauty. As I have followed her over the years I am continuously impressed by her creativity, her use of color and shape, and how her creations seem to come to life. All of my senses come alive as I swear I can feel the wind blow, hear the leaves rustle and the water flow, smell the spring air, and the list goes on. She has the unique ability to arouse the senses and calm the mind all at the same time. It is a true artistic gift. I believe she is a talent that will continue to inspire. She has one of the qualities that only the best of the best seem to have….her work always leaves me wanting more. Thank you, Michelle, for sharing your gift with all of us. I’ve come to know and admire Shell’s very accomplished work. But its all so much richer having also come to know her as an extraordinarily giving and supportive friend. The very best. My husband and I were married five years ago in beautiful Big Sur, California. We chose the Henry Miller Library as our wedding location, amongst the redwoods. Michelle’s invitations fit our style and wedding perfectly. We still get compliments on them. My sister-in-law is planning a wedding for next May and has chosen Michelle to do her wedding invitations. I’ve never seen invites like hers…I love her work. Beautiful, colorful and unique. 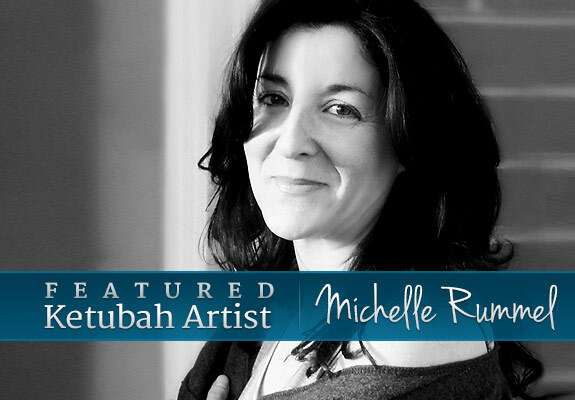 As a talented artist Michelle understands how visual imagery can be a powerful way to change the energy of a home and the individuals who reside there. She has a unique way of creating works of art that help chronicle the cherished moments of modern people young and old so that these memories live on forever. Michelle’s talent has no bounds. Everything she creates is sheer beauty. I have had the good fortune to follow Michelle’s work for over 10 years. A piece of her beautiful art hangs prominently in my dining room. I love to look at it each day. Michelle’s work is truly special and I cherish it. 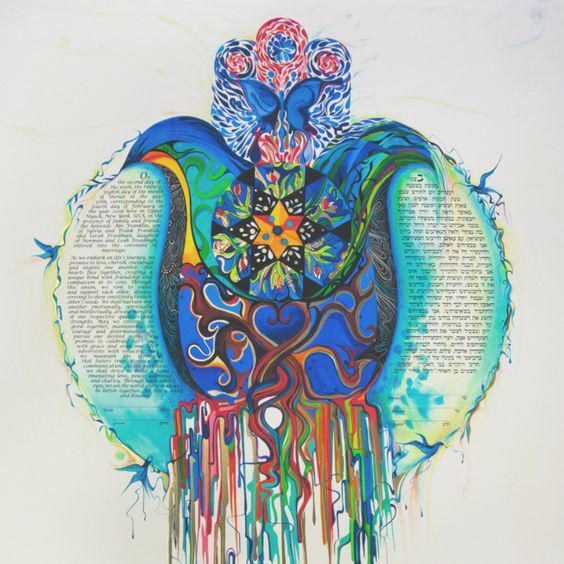 My path intersected Shell’s serendipitously and instantly I could see and sense the wonderful Nature connected spirit that shines out, and is the theme for all who come across her and her work. 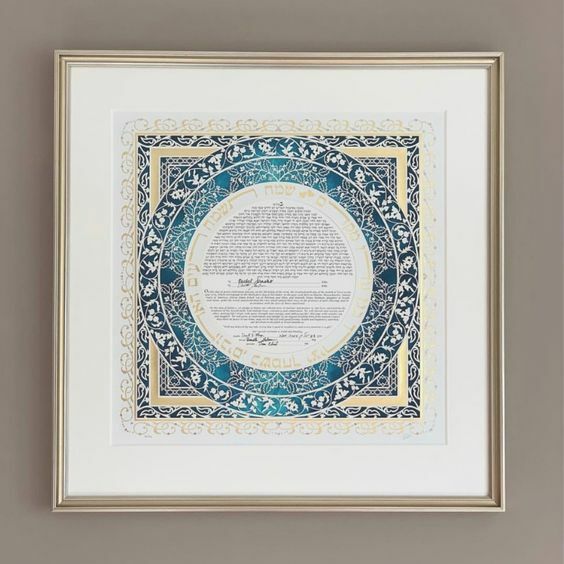 While I am not Jewish I am contemplate incorporating the Ketubah notion should I be lucky enough to meet someone to share my life with and of course Shell’s designs are so in keeping, contemporary but still carrying the essence of the Ketubah. 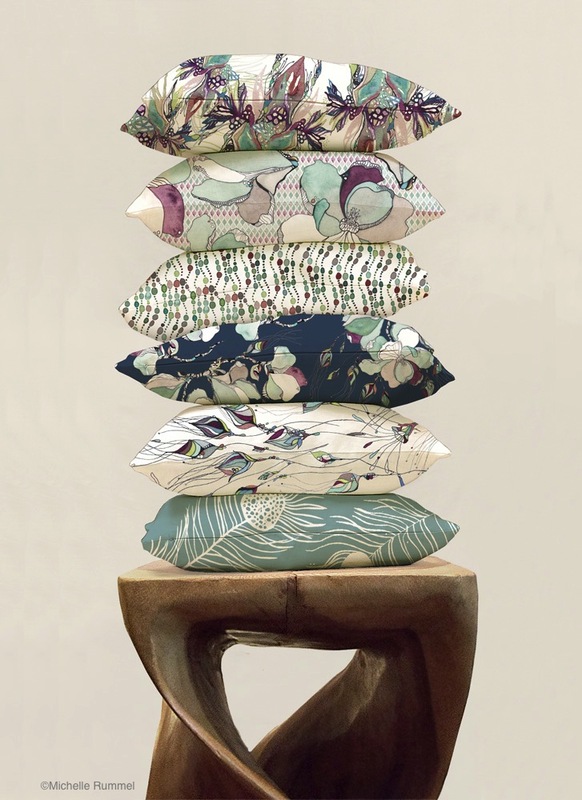 Over the years I have known Shell I have followed her art and the development of it into the design of unique and beautiful fabrics and products that bring her original beautiful artistic insight into the lives of homes around the World. She is an expresser…we all love her art work and her words, but she also has a gifted eye for photographing natures treasure and a musical ear which appreciates the beauty that can be found there and shares that with those lucky enough to enjoy her friendship. Bringing my Shell story up to date I am such a lucky person as I own an original Shell painting…it is one of my treasures and depicts a beach and ocean scene with the magical use of colour and with a flavour of Shell. It has very personal details which are typical of Shell’s perspective on life. 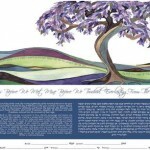 It is a pleasure to have my Ketubah art so beautifully represented by Ketubah.com. Thank you, Aliyah, for such a lovely feature post…you were a joy to work with on this project. My gratitude to all who have supported me as an artist through the years by choosing my art… It is such an honor to know my art lives with you. Many of my clients eventually become dear friends as you can see from the lovely comments above. Connections in life are everything to me and I consider myself most fortunate to have crossed paths with so many who have enriched my life and ultimately, my art.